QPR chairman Tony Fernandes has called for unity following Harry Redknapp's fall-out with midfielder Adel Taarabt. A public dispute erupted between the pair after manager Redknapp claimed Taarabt was overweight following last weekend's defeat to Liverpool. QPR, bottom of the table with one league win, host Aston Villa on Monday night. Fernandes tweeted: "Need less politics and get behind Harry and the players. All players should be unified." He added: "Liverpool showed what we are made of, good club, good fans, good players, great staff. No one is perfect. Let's enjoy Monday and hope everyone does their best." Redknapp criticised Taarabt's fitness, claiming the player was "three stone overweight". Taarabt, 25, rejected that claim in an interview with the Daily Mail, adding he was "fuming" not to be selected. Last week Fernandes issued an apology for the pair's "embarrassing" dispute. Fernandes said both men had been notified of the club's disappointment after Redknapp also granted a subsequent interview to the Sun, in which he described Taarabt as "the worst professional I have ever come across". At the press conference ahead of QPR's meeting with Villa, Redknapp insisted the midfielder was still part of his first-team plans. "I've had more ups than I have downs with Adel," he said. "I love his ability and talent. I just want him back to his best." Redknapp also claimed his relationship with Fernandes had not suffered as a result of the public row. 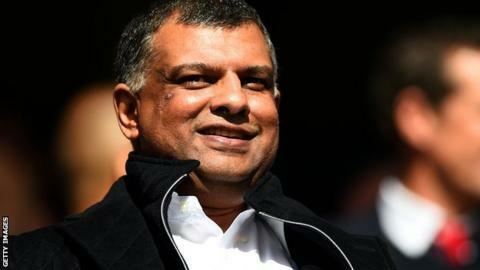 "My relationship with Tony Fernandes is as strong as ever," he said. "I spoke to him four times yesterday. We've all moved on."